Welcome! We have an active and vital English Department at Southern Illinois University Carbondale, with strong programs in creative writing (both at the undergraduate and graduate levels), literary and cultural studies, and rhetoric and composition. No matter your interest, as an undergraduate or graduate student or a potential colleague, you'll find much of interest to explore here in Carbondale. Here you'll find links to detailed information about our faculty, including their recent publications, and course offerings for first and second year writing students as well as English majors, minors and graduate students. You can also explore our two literary journals (The Crab Orchard Review, a nationally recognized literary magazine, and Grassroots, an undergraduate creative arts journal), opportunities we offer in Irish Studies, and our undergraduate and graduate student organizations. We're very pleased you've chosen to visit our department and hope you'll soon take an opportunity to visit our beautiful campus. If you are an alum of SIU Carbondale's English Department, we would love to hear about your life after graduation. Interested in a Graduate Degree in English? 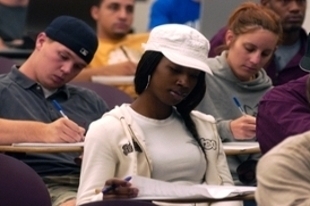 We offer graduate degrees in Literature, Rhetoric and Composition, and Creative Writing. 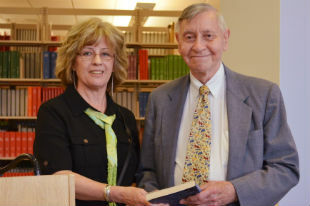 Department chair Elizabeth Klaver presents Carl Lutes with a copy of Rodney Jones’s book of poetry, Salvation Blues. Lutes graduated from SIUC with a major in English in 1948 and a Master’s in 1959. Why English at SIU Carbondale? Our faculty members are active researchers and writers who publish often in peer-reviewed journals and books and present their work at national and international conferences. Learn more about their recent publications.